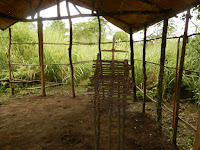 This past Sunday [August 14th] we set out for the village of Abari. 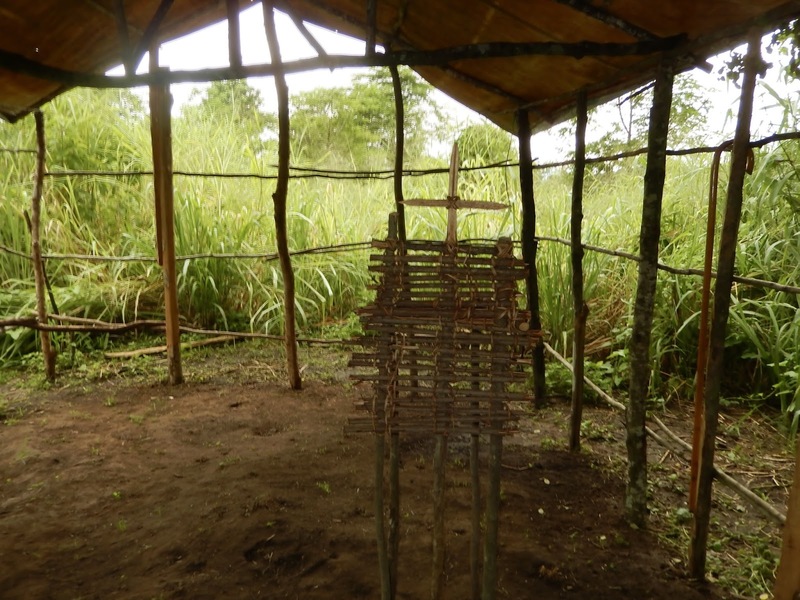 With Darash, our Anuak priest and Regional Dean, we were going to visit the first church of the Mezhenger people, planted by the Anuak congregation of Abobo. The road presented us with a few challenges. 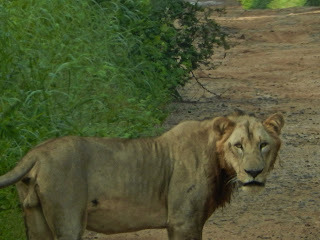 About half way there, we were challenged by a young male lion who stood determinedly in the middle of the road. He was not going to yield his territory! We stopped to take a photo while he stood there in majestic defiance. It was only as we restarted the car, as the engine roared back to life, and we began to move towards him, that he must have decided that discretion was the better part of valour, and loped away ahead of us until disappearing into the impenetrable grass growing alongside the road. Here and there baboons sauntered lazily off the road, birds flashed by - scarlet, blue, yellow, glossy black. We drove by a couple of crowned cranes, their crowns glinting golden in the sun. It was a very African drive. The road grew narrower and narrower. Finally we were snaking along in the mud, brushing through eight foot high elephant grass on either side of us, the raindrops on the grass glistening in the early morning sun, until it was as if we were driving through some sort of eco car wash. Eventually, the mud got the better of us, and the car, sinking down to its axels, became stuck fast. When efforts at digging us out seemed to fail, we decided to continue on foot. After all, the church ‘was only five minutes away’. Of course, it was an Anuak five minutes. Walking along, enjoying the wild beauty of our surroundings, I began to feel very African. Half an hour later, we came upon the incongruous sight of a cell tower. Undaunted, I continued on in my African safari mode, senses stretched out and attuned to the sights and sounds of what now seemed a sun-drenched jungle. Ahead, Darash stopped. “The vehicle is coming!” he said. He had heard it. Alas, my finely-tuned senses not withstanding, I didn’t hear a thing. Apparently my hearing was not as African as I had fondly imagined. Muddy but triumphant, our car pulled up, and once back inside, we drove the rest of the (let’s face it, a lot more than) five minute journey to the Mezhenger church. Quickly learning the Mezhenger greeting, “Digoya bongeh!” we greeted the people. Malchias, our Mezhenger lay pastor, took out a lute-like stringed instrument, and, and for the first time, we joined the Mezhenger in worship. Their beautiful lilting melodies, sung in the African five tone scale, were truly delightful. They were just as delighted at the deeper, more rhythmic Anuak hymns sung by Darash and Omot (the lay pastor of Abobo who had joined us on the way). After a simple service, we drove back through swirling clouds of butterflies and stopped and briefly joined in the worship at the Anuak church of Tiersiru, one of the satellite churches of the Abobo Mission Centre. There is was Grant’s privilege to give the church a name, “St Mark’s Anglican Church” of Tiersiru. After questioning the St Frumentius’ students about the apostle Mark during their examinations for the African Early Church History intensive, St Mark seemed an appropriate name! Our final stop of the morning was in Abobo town, and there a lunch of freshly caught nile perch, roasted over charcoal, awaited us, lovingly prepared by Awilli, one of our Mothers’ Union leaders, together with the women of Bethlehem Church, Abobo. It was a good morning! We are delighted to welcome theologians Chris and Suzy Wilson as our newest faculty members of St Frumentius’ ATC, together with their children Abigail and Matthew. 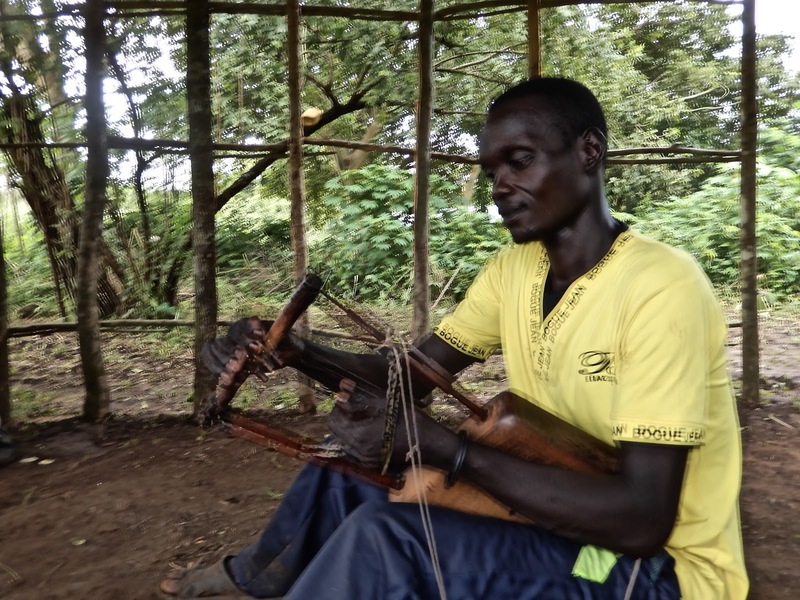 Please join us in praying for God’s blessing on their settling into life in Gambella. Please pray for the first year and second year students of St Frumentius' Anglican Theological College. Please pray for Johann Vanderbijl, our beloved dean, and for Louise, our librarian. 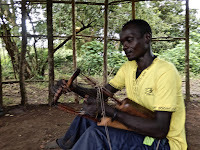 Please pray for continuing peace and unity among the peoples of the Gambella region. Please pray for peace and unity among the Amhara, Oroma and Tigray peoples of Ethiopia. Thank you to all who responded to the needs generated by the recent crisis of ethnic violence in Gambella. Those who wish to contribute to these ongoing needs, please see donate now link above.